Home » Apart vs. A Part: What’s the Difference? 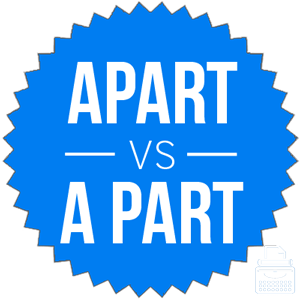 It can be difficult to remember the difference between “apart” and “a part.” They are awfully close in their appearance, and when you say the words verbally, they are almost indistinguishable. But despite similar sounds, the two have very different meanings, making it that much more important to keep them straight. What is the Difference Between Apart and A Part? In this post I will clear up any confusion you may have about apart vs. a part and give you a few ways to remember the differences. The rocks fell 30 feet apart. The family was split 100 miles apart. Apart from this cookie, I haven’t eaten anything all day. The whole room was silent, apart from Becky. May I have a part of your sandwich? Once we’re a part of this group, we all must pay dues. May I have part of your sandwich? Once we’re part of this group, we all must pay dues. Be there an adjective before “part,” the article “a” is necessary. I need to become ______ of a book club. It’s been three years since we split ______. Make sure to keep your feet spread ______. He was asked to be ______ of their inner circle. ______ from the windy, it’s quite nice outside. A good way to remember the difference between “apart” and “a part” is to remember the prepositions with which they are often paired. Keep those two apart from each other. I am a part of this community. A part of me can’t bear to be apart from you. Any of these tricks can help you remember the grammar of a part vs. apart. 1 What is the Difference Between Apart and A Part? Payed or Paid: What’s the Difference?